Residents at a mobile home development in Hayward have been out of water since Sunday due to a water main breakage and officials say it probably won’t be fixed until Friday. Roz Plater reports. Residents at a mobile home development in Hayward have been out of water since Sunday due to a water main breakage and officials say it probably won’t be fixed until Friday. "I paid cash for my house, one of the newer homes here," said Eden Garden Estates resident Linda Nardi, "I paid $198,000 and I can’t even take a fricking shower since Sunday." A maintenance worker at the 55-and-over Eden Garden Estates said an old water main cracked and the repair work has been hampered because of gas lines built on top of main. 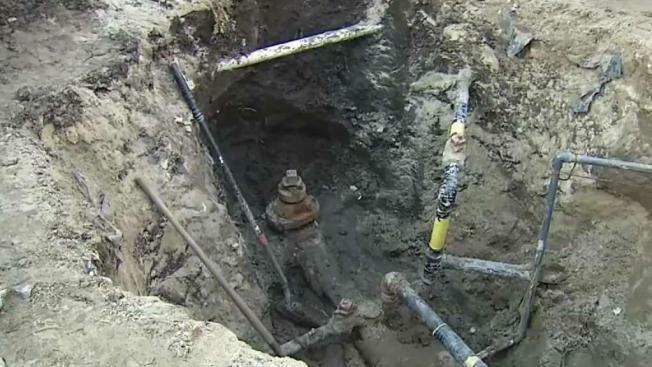 The gas has to be turned off so those lines can be reconfigured, then crews can start replacing the broken pipes. Meanwhile, residents were offered pizza for dinner, a jug of drinking water and a dozen porta potties. "My dishes are piling up, my laundry’s piling up, and it’s starting to smell in there," said resident Melanie Smith. "What are we supposed to do?" Some neighbors said they worry most about the seniors who can’t get around on their own. "We have seniors who are 80 and 90 years old, how the heck are they going to climb up in that outhouse?" Smith said. Residents got a flyer warning that their gas will be turned off Wednesday so crews can reconfigure the gas lines and work on the water main. They hope the water can be back on by Friday. "It’s a tragedy," said Nardi. "I can go to Home Depot to go to the bathroom at night or to the park in the morning to wash my face and brush my teeth, but it’s embarrassing ... I feel like I’m homeless."